In the pan-African capital of Johannesburg, Scientologists and guests gather, Saturday December 23, to celebrate the monumental opening of the region’s newest Church of Scientology. 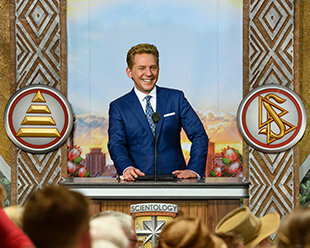 Leading the dedication ceremony, Mr. David Miscavige, Chairman of the Board Religious Technology Center, welcomes all those in attendance at the vibrant celebration on Saturday, December 23. Mr. Miscavige is met with thunderous applause during the inauguration ceremony held on the corner of Bram Fischer and Hunter Street in Randburg. This Grand Opening marks the third Church of Scientology to open in the Gauteng province. Mr. Miscavige officially dedicates the Church of Scientology Johannesburg North, joined by local parishioners who led the way in making the new Church a reality. With a festive spirit, Scientologists gather to welcome the historic moment when Joburg North opens the doors to its 70,000-square-foot Church. In the midst of lively Johannesburg, a bevy of balloons and a chorus of celebration ring out as the Church of Scientology Joburg North sheds her ribbon—launching an altogether new season of expansion. The crowd of over 1,500 Scientologists and guests celebrate as a massive new Scientology Church is commemorated in Northern Johannesburg. The Grand Opening ceremony was accented throughout with creativity and vibrant expression, led by the magical sounds of Djembe drums mixed with traditional dancers and the melodies of a local choir. Mr. David Miscavige with (left to right): Pastor Errol Jacobs, Eldorado Ministries; Chief Godfrey Fanie, Zalisidinga African Traditional Council; Ms. Amy Fakude, Speaker Emeritus of the Gauteng Women’s Parliament; and Mr. Martin Mande, Advisor to the U.N. Refugee Agency, South Africa. With the fall of a giant red ribbon, guests pour forth to take in a first look at the new Church of Scientology Johannesburg North. You could feel the energy in the air as the attendees receive their own up-close and personal view of the newest Church of Scientology. Located on the corner of Bram Fischer and Hunter Street in Randburg, the sprawling 70,000 square-foot facility spans a two-acre estate and tops a city rise, overlooking a Joburg it is expressly designed to serve. The new Church of Scientology Johannesburg North stands to both accommodate a thriving Scientology community and continue a compelling humanitarian legacy across the region. RECEPTION Open seven days a week, morning to night, the Church of Scientology of Johannesburg North Reception welcomes anyone wishing to obtain an introduction to Dianetics and Scientology. INTRODUCTORY SERVICES The Church of Scientology Johannesburg North provides for the delivery of all Introductory Services. These include an entire array of Scientology Life Improvement Courses to help better any aspect of one’s life. Among the many services available are evening and weekend Dianetics and Scientology seminars imparting an overview of fundamental principles and their application in life. DIANETICS & SCIENTOLOGY BOOKSTORE The Church of Scientology Johannesburg North Bookstore makes available L. Ron Hubbard’s works on Dianetics and Scientology. In all, Mr. Hubbard’s legacy comprises tens of millions of published words in dozens of books and thousands of recorded lectures. Materials are available in 50 languages. THE PURIFICATION CENTER Scientology Founder L. Ron Hubbard developed the Purification Program to free individuals from the mental and spiritual damage caused by drugs and toxins, through a regimen of exercise, sauna and nutrition—all of which are provided for in our Purification Center. The mural pays tribute to the vibrant life and spirit of today’s South Africa. Each of Johannesburg North’s auditing rooms is ideally appointed to provide the calm, distraction-free setting requisite to achieving spiritual enlightenment. THE ACADEMY The Academy is where Scientologists train to become auditors (spiritual counselors), capable of applying the technology of auditing to help others attain spiritual freedom. The Johannesburg North Academy comprises multiple course rooms, each devoted to a different aspect of training. THE FERN CAFÉ The Café welcomes visitors touring the Church and provides a gathering place for those attending the many scheduled events. It is further provided for parishioners during breaks in their Scientology services. The Café also offers visitors an al fresco break in the South African sun. THE CHAPEL The Chapel, lined with the Codes and Creed of the Church of Scientology, provides for all congregational ceremonies and services—including Sunday Services, Weddings and Naming Ceremonies. The Chapel also serves as an ideal venue for workshops, banquets and events in the name of community collaboration for the betterment of Johannesburg North. Church of Scientology caps season of expansion with dynamic Grand Opening in northern hills of the “City of Gold”—Johannesburg. Out of the shadow of the past a new generation is rising up, making a voice for themselves and creating a land defined by freedom of expression and spiritual awareness—a new South Africa. Historically acknowledged as the Cradle of Humankind and now known for its inescapable, vigorous energy, a once divided Johannesburg (Joburg) continues to be on the forefront of unified change. As one of the top 50 cities in the world in terms of both size and commerce, this pan-African capital is home to many creative and cultural forces—individuals and organizations set upon cutting a better and brighter path to community success. That spirit of innovation and new hope was resonant on a warm Saturday afternoon in Johannesburg North as over 1,500 Scientologists and guests gathered to dedicate the city’s stunning Church of Scientology on the hills of Randburg. The Grand Opening ceremony was accented with creativity and vibrant expression, led by the magical sounds of Djembe drums mixed with traditional dancers and the melodies of a local choir. The festivities soon evolved into a chorus of dignitaries from all over Johannesburg and Gauteng—welcoming the Church and forecasting a propitious future upon the cutting of its giant red ribbon. It is after all, a future born out of a humanitarian legacy spearheaded by the Church in the Gauteng province. In point of fact, the Scientology sponsored United for Human Rights campaign has inspired a Gauteng rights movement, seeing more than 40,000 empowered with the knowledge of their rights. There’s also the Drug-Free World program where, in Joburg alone, more than 300,000 Truth About Drugs booklets have been distributed, contributing to a drop in drug-related crime across high-risk zones—the first in over a decade. The new Church stands to both accommodate a thriving Scientology community and continue a compelling humanitarian legacy. Located on the corner of Bram Fischer and Hunter Street in Randburg, the sprawling 70,000-square-foot facility spans a two-acre estate and tops a city rise, overlooking a Joburg it is expressly designed to serve. That commitment of service defined the common thread present among the city and provincial officials on hand to welcome the new facility, including: Chief Godfrey Fanie, of the Zalisidinga African Traditional Council; Mr. Martin Mande, Advisor to the U.N. Refugee Agency, South Africa; Ms. Amy Fakude, Speaker Emeritus, Gauteng Parliament for Women; and Pastor Errol Jacobs from the Eldorado Ministries. Each spoke of their fortuitous interaction with parishioners and volunteers participating in the Church’s programs. The new Johannesburg North Church provides visitors with an introduction to Dianetics and Scientology, beginning with the Public Information Center. Its displays, containing more than 500 films, present the beliefs and practices of the Scientology religion and the life and legacy of Founder L. Ron Hubbard. The Information Center also details the many Scientology supported humanitarian programs. These include a worldwide human rights education initiative; a far-reaching drug education, prevention and rehabilitation program; a global network of literacy and learning centers, and the Scientology Volunteer Minister program, now representing the world’s largest independent relief force. Johannesburg North’s Chapel provides for Scientology congregational gatherings that include Sunday Services, Weddings and Naming Ceremonies. It will also host community-wide events, open to members of all denominations. The facility further includes multiple seminar rooms and classrooms, and an entire wing dedicated to Scientology auditing (spiritual counseling). The opening of the new Church of Scientology Johannesburg North comes during a period of tremendous expansion for the religion with more than 60 new Churches of Scientology from Los Angeles to Tampa, London to Milan, Tel Aviv to Tokyo and Kaohsiung to Bogotá. Over the past decade, those openings have driven worldwide expansion for the religion to a rate surpassing the previous 50 years combined. In 2017, openings of new Churches of Scientology have taken place in Auckland, New Zealand; the San Fernando Valley, California; Miami, Florida; Copenhagen, Denmark; Dublin, Ireland; Birmingham, England and Amsterdam, Netherlands. More Church openings are planned in 2018 for cultural epicenters in Europe, Latin America, North America and Australia.